Some people take their golf extraordinarily seriously. One such group of die-hards were the proprietors of the Richmond Golf Club in Surrey, England, who drafted an interim set of rules explaining what players must do should Nazi aircraft bomb the greens mid-game. 1.) Players are asked to collect Bomb and Shrapnel splinters to save these causing damage to the mowing machines. 2.) In competitions, during gunfire, or while bombs are falling, players may take cover without penalty for ceasing play. 3.) The positions of known delayed-action bombs are marked by red flags placed at reasonably, but not guaranteed safe distance therefrom. 4. )Shrapnel/and/or bomb splinters on the Fairways, or in Bunkers within a club's length of a ball may be moved without penalty, and no penalty shall be incurred if a ball is thereby caused to move accidentally. 5.) A ball moved by enemy action may be replaced, or if lost or destroyed, a ball may be dropped not nearer the hole without penalty. 6.) 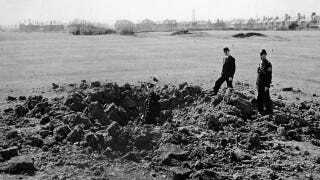 A ball lying in a crater may be lifted and dropped not nearer the hole, preserving the line to the hole without penalty. 7.) A player whose stroke is affected by the simultaneous explosion of a bomb may play another ball from the same place. Penalty, one stroke. Via Lists of Note. Top image of the North Shore Golf Course bombing via Histomil.